At the age of four, His Holiness Penor Rinpoche invited him to stay in Namdroling Monastery and thereafter looked after him as his own child. When he was 15, he received the esoteric teachings of Tantra thus laying the foundation for the higher practices. He entered Ngagyur Nyingma Institute (Shedra), a branch of Namdroling Monastery and an advanced college of Tibetan Buddhism where he studied general Buddhist Philosophy as well as the distinct Nyingma Teachings. He also studied Tibetan grammar, poetry, and Tibet’s political and religious history. Unlike other students, he was brilliant in his studies. In his fifth year in his university, Gyangkhang Rinpoche displayed his scriptural knowledge by giving a lengthy discourse on Sangwa Nyingpo (Magical Net Tantra, a Mahayoga Teaching) in front of His Holiness The Fourteen Dalai Lama and an assembly of thirty thousand people both lay and ordained from all the different religious traditions of Tibet. He also debated on this subject and emerged victorious. His Holiness the Dalai Lama praised his wisdom in front of all and offered him a khata, a traditional scarf, encouraging him to hold, sustain and disseminate the teachings of Lord Buddha for the benefits of all beings. He received the empowerments, oral transmissions and pith instructions on the whole Kama and Terma teachings (the distinct Nyingma Teachings of the Transmitted Precepts and the Rediscovered Treasure Teachings) from His Holiness Dilgo Khyentse Rinpoche, Dodrubchen Rinpoche, Jadrel Rinpoche, Khenpo Jigme Phuntsok Rinpoche, and Nyoshul Khen Rinpoche. He specially received the distinct teachings of Palyul Tradition including the Namchoe Teachings from His Holiness Penor Rinpoche. He not only received Ngondro (Preliminary Practices), Tsalung (Winds and Channels), and Dzogchen (Great Perfection) teachings but also practiced them perfectly. He also learned the Buddhist philosophy mainly the sutra and tantra under the guidance of many great Khenpos and masters of his time. In 1994, under the Bodhi Tree in Bodh Gaya, Gyangkhang Rinpoche received the vows of full ordination from His Holiness Penor Rinpoche. At that time, he was given the name Thupten Mawai Nyima Jigme Singye Chogle Nampar Gyalwai De. 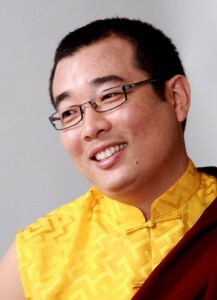 In 1995, he completed the nine years course in the institute and considering his high level of knowledge, Penor Rinpoche bestowed him the title of a “Tulku Khenpo” and recognized him worthy of a dharma teacher who can guide others towards the path of enlightenment. Before becoming enthroned as with the title of a Khenpo, he gave teachings at many occasions in Namdroling of America and Asian countries like Hongkong, Taiwan and others. The teachings that he gave included Buddhist teachings on Bodhicitta, meditation and philosophy. He also gave empowerments and oral transmissions. Gyangkhang Rinpoche has realized the meaning of Lord Buddha’s teachings both the sutra and tantra. On several occasions, he has represented His Holiness by giving advice, instructions and teachings in many dharma centers around the world. At present, he is teaching in the Ngagyur Nyingma Institute (Shedra) and also shouldering the monastic responsibilities.